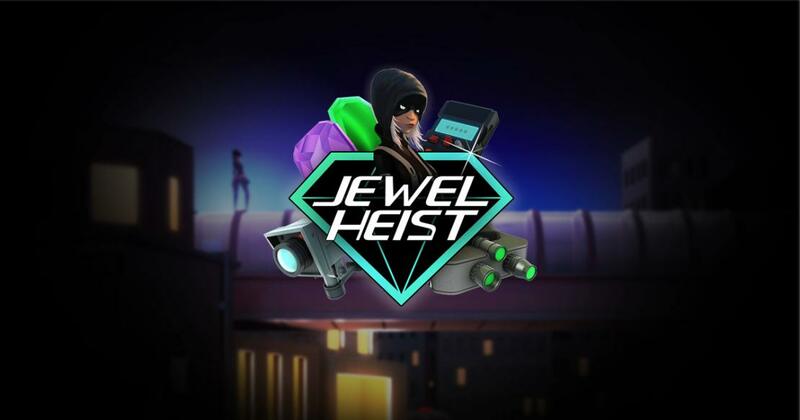 A Magnet Gaming title, Jewel Heist is offering us a gemstone and robbery related theme, along with a decent jackpot and a couple of progressives. Jewel Heist, though a robbery themed slot machine, seems to have more to do with the gemstones that are stolen, than with the criminal doing the job. You see several pieces of equipment used as major feature symbols, but otherwise you just get the symbols with the diamonds, sapphires, emeralds, rubies and others. Each one comes in its own cut and color, and they’re usually shown in a small animation that makes them look even more interesting. There is a constant companion next to the reels, with a female burglar sitting there. I’d call this a decent looking game, particularly because of the way they handled the gemstones. You rarely get another type of image on the reels, so their design is very important. You are going to have 17 lines that pay both ways, arranged on 5 reels. The game will deliver several progressive jackpots, while its own rewards appear to reach $8,000. For the feature list, they’ve gone with scatters that trigger features like Break-In, The Heist or Game Chance. In exchange for having 17 active lines, the slot will ask you to select a total bet. The bet has a level of 1 to 20 that you modify as you change the total amount. Values range from $0.10 to $8. The best combo will pay up to $8,000 if you get five symbols with Diamonds on an active line. The other prizes are the Super Jackpot and the Jackpot, two progressives that also enhance the game’s profitability. One of the things that will influence the way you play this game is the fact that its winning combinations are going to pay starting from both sides, while most slots use just the left side as a starting point. Several scatter symbols are employed by the game, and having them appear several times will trigger a feature. There are three symbols and three features. The Gemstone Case will be the one delivering you to the Break-In feature. The symbol that has the Pair of Night Goggles will trigger The Heist. As for the scatter with the image of a Control Box of some kind, that one gets you to a feature called Game Chance. Jewel Heist will have a reasonable RTP of 96.50%, along with some decent graphics, but there are also less interesting things in it, like the theme or the features that don’t appear that often.